ReportBuilder is the defacto standard for Delphi reporting solutions. Delphi developers have consistently voted ReportBuilder Product of the Year (1999 – 2002) and Best Reporting Tool (1999 – 2003). The genesis of ReportBuilder was the desire to deliver a product that does for Reporting what Delphi has done for Windows programming. In that spirit, ReportBuilder provides both a RAD environment and an object-oriented platform for solving the reporting equation. Use RAP to build portable reports. RAP enables developers and end-users to code calculations and event-handlers without Delphi. The run-time code can be saved with the report definition, outside of the application executable. Distribute RAP royalty-free, as part of an end-user reporting solution. RAP adds a Calc tab to the Report Designer that provides an easy to use interface for coding report event-handlers. Use DADE to visually define and link SQL queries. DADE enables developers and end-user to quickly and easily build and link SQL queries that can be saved as part of the report definition. Distribute DADE royalty-free, as part of an end-user reporting solution. DADE adds a Data tab to the Report Designer that provides an easy to user interface for building and linking SQL queries. Build full featured End-User reporting solutions that can be distributed royalty-free. Use the Report Wizards and Drag-and-Drop tools to quickly produce layouts. Then refine the layouts using the MS Office style Report Designer. Build complex reports using a full suite of components: Text, Lines, Shapes, Charts, Barcodes, Regions, and Subreports. Elegantly model free-form reports, nested reports, side-by-side reports and drill-down reports. Use the datapipeline components to access data from databases, text files, and in-memory data structures such as arrays and lists. Create custom components to extend the power of the Report Component Library (RCL). The most powerful reporting solution for the Delphi developer. The ReportBuilder Report Designer is really a pleasure to use. Because it works the way other Microsoft Office applications work, the Report Designer saves you the hassle of learning a new interface. The Report Designer is fully integrated with the Delphi IDE, thereby allowing you to use either the Report Designer, the Delphi Object Inspector, or both. And the user-interface is rich, providing multiple ways for you to complete your work (for instance, any property of a report or report component can be set in the Object Inspector or via the speed menus and dialogs of the Report Designer). By utilizing the drag-and-drop capabilities of ReportBuilder, you can create data-aware components and associated formatting components in seconds. You can also use the report creation capabilities of the Report Wizard to create professional quality reports with just a few clicks of the mouse. Report Builder provides a level of flexibility unmatched by any other reporting tool ever created. This flexibility is due to the large number of report components, the ability to group components using regions, the ability to create relationships between stretching components such as memos, richtext and subreports, and the flexibility of nesting full-fledged reports within one another. With ReportBuilder, there is no limit to the complexity which you can resolve. ReportBuilder provides a powerful feature found in no other competing product: multiple nested drill-down subreports. This feature can be used to create a highly sophisticated ‘tree view’ of the data: an initial summary report is displayed and additional information can be accessed simply by clicking on an item in the Print Preview window. The page is then re-rendered with more detail information shown. You can also utilize this technology to make the Print Preview window ‘clickable’ so that you can create solutions of your own, such as launching an independent report when an item in the report is clicked. The potential uses of the ‘hot’ Print Preview window are literally endless. Twenty-one components are delivered standard with ReportBuilder. Everything from labels, to shapes, to lines, to memos, to checkboxes, to barcodes, to charts is offered. The feature set provided by these components is a super-set of the features offered by other products. And when it comes time to handle those really complex reports, isn’t it nice to know that you have a super-set of the reporting functionality available rather than a subset? 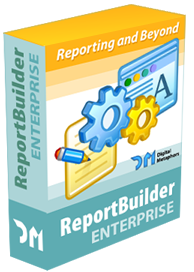 ReportBuilder is a reporting development environment – but it is also coded as a set of real Delphi components. Therefore, you can use the Object Inspector to configure any component in a report or create event handlers for any component in a report, all at Delphi design-time. Event handlers allow you to modify the report layout or perform calculations while the report is generating, which can be vital in getting the exact output you want. While other products may be written in Object Pascal, they may not support standard Delphi constructs like event handlers, form inheritance, or dynamic report creation. The truth is that true Delphi integration is technically challenging, and products that take short-cuts to avoid these challenges must eventually invent other ‘technologies’ to replace what is already provided in Delphi. This practice introduces unnecessary and potentially unstable code into a product. For example, there is a competing product that advertises two types of report creation: code-based and visual. But standard Delphi components – as most developers know – should already have both a visual and run-time interface. True Delphi components are inherently code-based and visual; if they are not, then they are not designed in a standard way and some new ‘technology’ has been invented. The fact that this design also creates two learning curves – one for the visual and one for the code-based – is also a serious drawback. ReportBuilder leverages standard Delphi technology wherever possible. This leverage keeps unnecessary and potentially unstable code from being introduced into the product and significantly reduces the learning curve for developers who are accustomed to working with standard Delphi implementations. The feature set required of a professional reporting product is prodigious. It is impossible to code every feature exactly the way a developer might want to see it implemented in their application. In order to answer the necessity of customization, ReportBuilder has been designed as a reporting platform. This platform allows developers to replace any dialog displayed in the user-interface with one of their own; they can create new report wizards, data pipelines (for native data access to proprietary data formats), devices (for conversion of native ReportBuilder output into any format), and report components (to handle any special reporting requirements). All of these tasks can be accomplished without changing the source to ReportBuilder itself, which is why we say ReportBuilder truly is a reporting platform. Included with the Enterprise edition, Report Application Pascal, or RAP, allows developers and end users to code calculations and complex event handlers at run-time. RAP enables the entire report definition (data, calculations, and layout) to be stored outside of the application executable. RAP enables developers to include Object Pascal code and Delphi-style event handlers within reports, making report layouts stand alone entities that can simply be loaded and executed. A new reporting tool may look great. But how fast can you get through the learning curve? Where competing products offer scant descriptions or reference-style help, ReportBuilder offers a complete learning system. The Developer’s Guide provides documentation on the fundamentals of the product and then guides you through a series of tutorials that show how to build simple to highly complex reports. The more advanced tutorials even show how to deploy your reports in a working application. Once you have completed the tutorials of the Developer’s Guide, you are ready to pick apart the large number of demo reports and demo projects provided with the product. These demos provide a concrete example of how some of the more advanced features of ReportBuilder can be used. Finally, the exhaustive, 1,500 topic on-line help provides reference information on the components, properties, methods, and events you will find in the product. The help is done in the same style as the Delphi help itself, so it is very easy to use. Learning ReportBuilder, an end-user guide that is downloadable for free from this site, is a comprehensive interactive learning system designed to teach end users how to work with ReportBuilder applications. It comes with a 150 page PDF, a stand-alone application complete with a database, and a help file. Together, these four sources of information – the Developer’s Guide, the sample projects, the on-line help, and Learning ReportBuilder – create a system that will help you and your end users get the most out of ReportBuilder in the least amount of time.